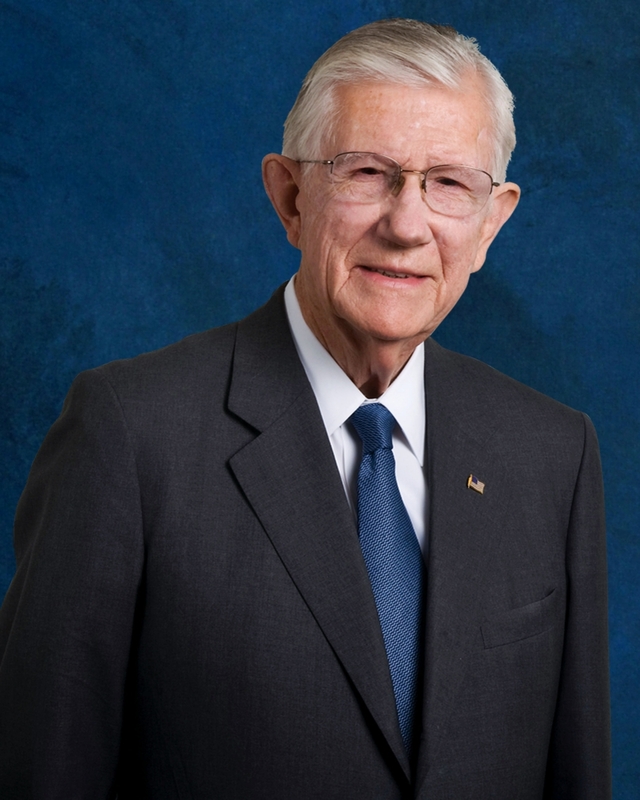 Charles B. Runnels, chancellor emeritus of Pepperdine University, passed away on October 25, 2016. He was 91. Born in Texas, Runnels began his college career at age 16 at Stephen F. Austin University, earning his bachelor of science degree in 1948. He soon after enlisted in the Navy Air Corps, completed midshipman school at Columbia University, received flight training in Pensacola, Florida, and spent one year serving in the World War II Asian theatre. After four years of active duty in the United States Navy, he completed law school at the University of Houston in 1956. Runnels was first introduced to Pepperdine in 1967, “on loan” from Houston-based Tenneco Corporation to help search for a new campus for George Pepperdine College—joining the site selection committee that ultimately chose a Pacific panorama from 40 possible venues. The two-year assignment turned into a permanent calling, and Runnels became an integral part of the construction plans of the new liberal arts college campus. Soon after the University’s historic 1972 move from South Central Los Angeles to the scenic Malibu coastline, the Runnels family gathered solemnly for the dedication of the Raleigh Runnels Memorial Pool at Firestone Fieldhouse. Made possible by legendary Seaver College benefactor Blanche Seaver, who had become a close friend to Runnels, the pool honors the Runnels’ second son who passed away from cancer the year before he would have been a freshman at Pepperdine. After serving as the University’s vice chancellor from 1971 to 1984, Runnels was named chancellor in 1985. A gifted advancement man with no formal training in the art and angst of donor relations, his rules of engagement were simple: head first, hand outstretched, heart on sleeve. As chief fundraiser for the University, Runnels’ personal philosophy of investing in Pepperdine students rather than the institution itself inspired many to become friends of the University. Runnels personally raised money for thousands of student scholarships, always keeping students his top priority. He successfully coordinated fundraising activities for the $100 million Wave of Excellence campaign in the 1980s and served as one of three co-chairs of the $300 million Challenged to Lead campaign in the 1990s. His fundraising accomplishments further resulted in the Charles B. Runnels Endowed Scholarship awarded to students at Seaver College. Named “Outstanding Professional” by the National Society of Fundraising Professionals, he always eschewed credit for the University’s success, passing kudos instead to the pantheon of friends who believed in its mission. A man of deep faith, Runnels was a lifetime member of the Churches of Christ. He attended the Culver Palms Church of Christ in Culver City, California, where he also served as an elder. Runnels’ was also the founder and decades-long steward of the Youth Citizenship Seminar. One of his proudest career accomplishments, the five-day program brings 250 outstanding high school juniors to Pepperdine each year to explore themes of free enterprise, leadership, freedom, and faith. Along with his wife, Amy Jo, Runnels continually and faithfully dedicated time each day to phone friends, send birthday blessings, and write personal notes. Whether called to a podium to issue a tribute or to a pulpit to deliver a eulogy, he always preferred the personal touch of reciting poetry rather than standard prose. In 2008 Runnels was honored at the 32nd annual Pepperdine Associates dinner for his extraordinary achievements and his own giving spirit to Pepperdine. The black-tie dinner, entitled “Celebrating Charlie,” featured special appearances by George Foreman and Tommy Lasorda, as well as a performance of “Lullaby of Broadway” by the Seaver College Alumni Ensemble. A fervent supporter of Pepperdine Athletics, Runnels was also an ever-present fixture on the sidelines of Waves sporting events. The University honored him in 2010 with the dedication and naming of the Waves athletics complex as the Charles B. Runnels Sports and Recreation Village. That same year, he received an honorary Doctor of Laws degree at the Seaver College commencement ceremony in recognition of his many decades of service to Pepperdine. Runnels is survived by his wife, Amy Jo ('00); sons, Duke Runnels and Tyler Runnels ('78); daughter, Susan Runnels Plumb ('80); daughters-in-law, Ginger Runnels ('75) and Jasmine Niklas Runnels ('78); son-in-law, Charles Plumb; and grandchildren Chase Runnels ('05), Megan Runnels ('10), Alex Robertson ('09, JD '14), Jessica Robertson, Christopher Runnels, and Caitlin Runnels. A memorial service for the Pepperdine community and Runnels' many friends will be held Monday, November 28, at 10:30 AM in Firestone Fieldhouse.